One of the aspects of the book publishing industry which has seen the greatest changes in the last decade is how books are sold. Thus we thought a look at statistics on book stores may provide an interesting perspective on the business. 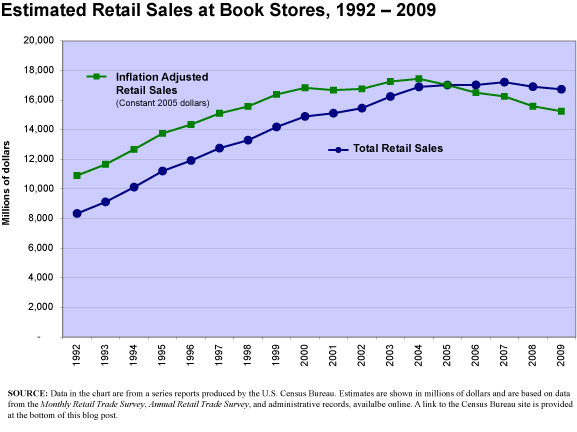 The following graph shows total retail sales at book stores for the period 1992 through 2009, both in and in inflation-adjusted dollars. There has been growth in sales over this period, although since 2000 that growth has stagnated and, in fact, has not kept up with inflation since 2004. One thing that struck us in looking at these data was the fact that book store sales, as reported by the U.S. Census Bureau, include a whole lot of sales of things other than books. Stores sales are broken into categories. These categories, etablished by the Census Bureau, include such things as “groceries and other foods for human consumption,” “men’s wear, including accessories,” “women’s, juniors, and misses’ wear, including accessories,” “computer hardware, software, and supplies,” and “toys, hobby goods and game,” to name but a few. This caused us to look more deeply into the data and pull out book sales so we could look at those separately from non book sales hoping this would give us a better picture of what’s going on. 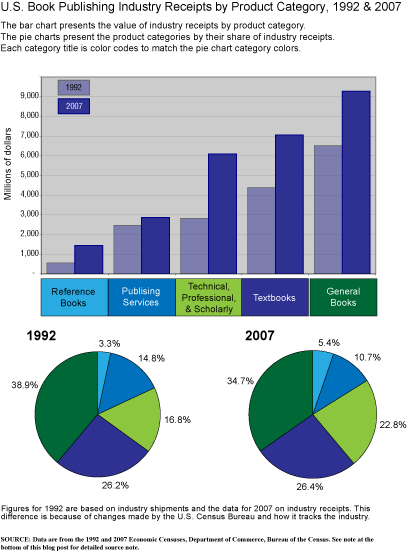 In order to get to the category-by-category breakdown of book store sales we had to limit ourselves to data for full Economic Census years, 1997, 2002, and 2007. 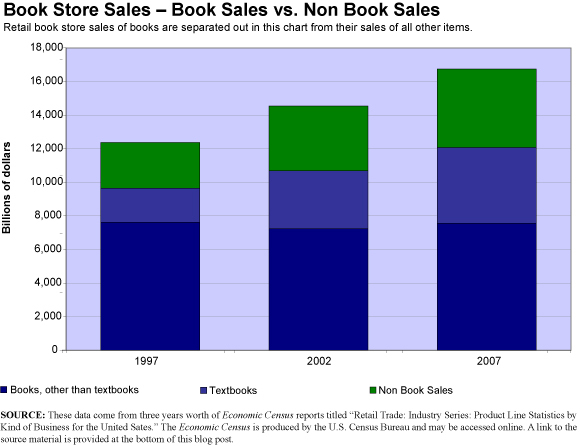 What becomes clear looking at this second graph is the fact that the non-book sales have grown at a much faster clip (71.7% from 1997 to 2007) than have book sales (25.1%). 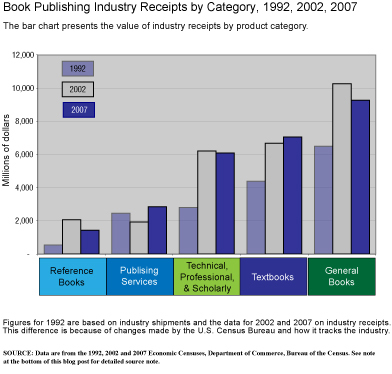 Furthermore, the growth in book sales is dominated by increased sales of textbooks, which grew at a rate of 123.3% between 1997 and 2007 whereas all sales of books other than textbooks actually declined by 0.9% during the same period. Yes, yes, we know. These data do not cover eBook sales…which we have seen in prior posts are a category that’s still very hard to track. 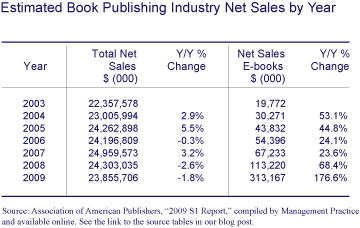 Also, as of 2009, eBooks represented 1.3% of actual book sales (see earlier post, here). So, while eBooks aren’t a part of this look at book retailing, these data are interesting, trustworthy, and provide a most fascinating picture of how book retailing is being done these days, not least the sorts of changes happening in this area. We’ll look into comparing these data with online sales of books next. Please note that the data in the first graphic are total book store sales whereas the data in the second graphic are total book stores product sales which are slightly different. For those who are interested, here’s a table with the figures charted above. We’re still working on answering the question posed in our last post. In the process, we keep running into the idea of selling more for less. So, we thought we’d think that through a little bit today. This somewhat clichéd advice made us think…. is that really true for books? Are books—whether eBooks or pBooks—the sort of items that people will buy many more of if the price is lower? Just how elastic are book prices? Price fluctuations have some impact on almost any product’s sales. However, the extent to which a product’s sales are influenced by changes in its price varies; and we refer to this phenomenon as price elasticity. For some products price elasticity is obvious. Gasoline is something we need, and, despite the price, we’ll buy it. This means the price of gasoline is relatively inelastic. Sure, when the price is really high, we’ll buy a bit less and when it’s really low, perhaps we’ll buy a bit more. Luxury items are examples of the sorts of products with very elastic prices. They aren’t necessities so we tend to buy a whole lot more of them when prices are low and a whole lot fewer when prices are high. Which brings us to the question: Just how elastic are book prices? Your answer is likely to reflect your attitude towards books. Are they necessities or luxuries? What do you think? There is another thing that complicates the statement in the title of this post. Just because book prices are low doesn’t mean that I suddenly have lots more time to read and will therefore run out (jump online) and buy four books a month instead of one. Unlike music, which can be enjoyed while doing other things, books tend to be a bit more demanding of their consumers, at least if the books are actually read. So, demand for books has a different feel than does demand for something like, say, calendars. It is this difference in the market for books that makes us doubt the wisdom of “Sell More for Less.” More accurately, we don’t doubt the theoretical truth of the statement; we doubt the assumption it depends upon–that demand is unlimited. (1) This is a quote from an interesting article by Rory Maher titled Kindle Fantasies are Running Wild – But, For Now, Amazon Is Losing It’s Shirt, available here.